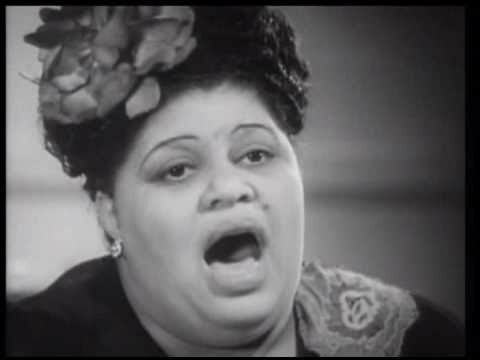 Vocalist June Richmond is best remembered today as the first African-American performer to sing with an all-white band. 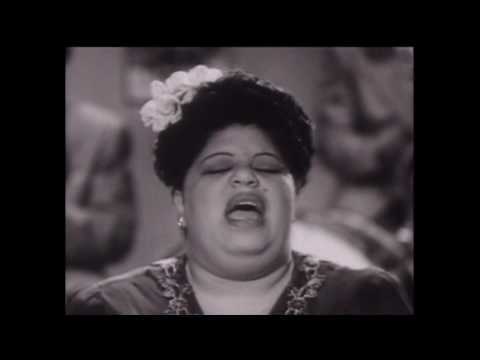 A blues vocalist in her early years, Richmond later embarked on a solo career as a singing comedienne in the mid-1940s before moving to Europe, where she remained for the rest of her life. Born and raised in Chicago, Richmond began her career at age 15 as a dancer, and later a singer, at the famous Grand Terrace Ballroom, She retired briefly in the early 1930s to marry and raise two daughters. The show business bug soon bit her again, though, and she returned to singing, working small jobs around Chicago before joining a vaudeville unit. Touring the country, she eventually ended up in Los Angeles, where she sang at the Paradise Cafe before becoming part of Les Hite’s band. She toured the West Coast with Hite and appeared in the group’s 1937 short subject Murder in Swingtime. Based at the Los Angeles Cotton Club, Hite’s outfit was considered one of the top African-American orchestras of its day, and Richmond’s position as featured singer soon brought her to the attention of Jimmy Dorsey and Bing Crosby, on whose radio show Dorsey’s band starred. After hearing Richmond perform one night in mid-1937, Dorsey and Crosby invited her to their table and offered her a job. 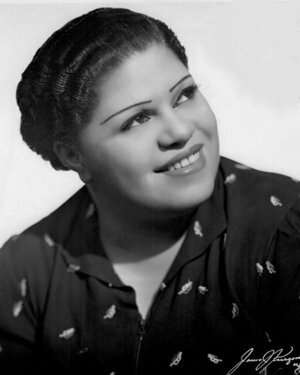 No African-American singer had worked publicly with a white orchestra up to that point, and Richmond’s acceptance helped pave the way for others to follow, including Billie Holiday, who joined Artie Shaw in early 1938, and Bon Bon, who went on the road with Jan Savitt’s band in 1938. Richmond proved popular with critics and the public. 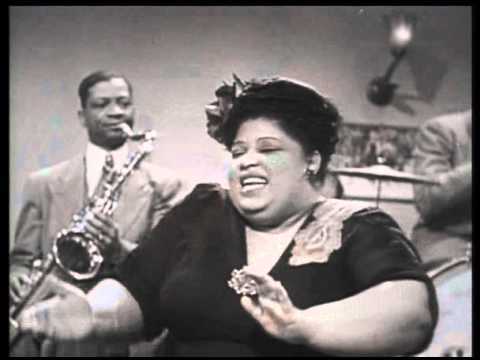 She was as equally known for her weight as her incredible blues vocals and effervescent stage presence. Tipping the scales at 220 pounds, a hundred pounds more than the average weight of a woman in the 1940s, the press typically used words like “hefty” or “portly” to describe her. She used her weight to her own advantage, though, making it part of her act. As experienced by all black singers who worked with white bands in that era, prejudice often reared its ugly head for Richmond. While singing with the band at the Hotel New Yorker one night in early June 1938, she experienced what journalists at the time called an “unpleasantness” in relation to the hotel. Soon after, Dorsey’s organization announced that Richmond was no longer with the band, sparking a flurry of rumors and speculation that the hotel incident had caused her to leave. Others denied that the incident had anything to do with her departure, citing the fact that Richmond was seen dining at a ringside table in the hotel the first night after the Dorsey band had left. Richmond herself, at the time, stated that she hadn’t left Dorsey’s band but was only taking a vacation while the orchestra toured in the South. She indicated that she was to rejoin the band in two weeks for a Pittsburgh engagement. She remained with them through at least July but left soon after, ending up in Cab Calloway’s orchestra. Richmond sang and toured with Calloway’s band until June 1939. After performing a few solo dates, she joined Andy Kirk’s Mighty Clouds of Joy in early July. With Kirk’s band, Richmond found a solid home, staying with the orchestra for five years. Her bluesy vocal style fit in perfectly with the group’s sound, strongly contributing to their success. During her time with Kirk, Richmond received billing as a featured vocalist. Switching from blues to comedy, Richmond left Kirk’s band in May 1944 to embark on a solo career. Her act included specialty numbers and self-deprecating humor, usually revolving around her weight. Working the theater and vaudeville circuit, she initially found success. In June 1944, she made the RCM soundie Hey, Lawdy, Mama and appeared in the 1944 Kay Kyser film Carolina Blues. That month she also joined the “all-sepia” cast of the short-lived show 4 and 20 Blackbirds in its San Francisco debut. In 1945, Richmond made another RCM soundie, Baby Don’t You Love Me Anymore, and late in that year signed with Mercury Records, releasing a few sides for that label. In summer 1945 she signed on for a major role in the mixed-race musical comedy Are You With It?, starring Jane Dulo and Johnny Downs, which opened in Philadelphia in October 1945 and moved to Broadway the following month. Richmond proved very popular in her role, which received fifth billing, and in December 1945 she became the first to record songs from the show on Musicraft. She remained in the cast until the production closed at the end of June 1946. She then returned to the vaudeville circuit and appeared in the 1947 all-black musicals Reet, Petite and Gone and Ebony Parade as well as the 1948 black musical short The Dreamer. Despite her success on Broadway, Richmond’s career struggled after the show closed, and in February 1948 she was forced to file bankruptcy after a $300 judgment was handed down against her. The filing, which was made public by gossip columnist Walter Winchell, listed her as having no assets with debts of $5,800. After a judge refused to add the $300 judgment to the bankruptcy, Richmond was forced to work without pay until it was settled. At the time of the bankruptcy filing, Richmond had been planning an extended European tour. Finally able to kick it off in October 1948, she opened in London to rave reviews. From England she went to Scandinavia, where she stayed for three years, working in both Stockholm and Copenhagen. Finding herself in demand and performing at top clubs, she never returned to the United States, working in England, France, Belgium and Sweden, among other locations, until her death in August 1962 in Sweden, at the age of 47. Rumors in July 1942 speculated that Richmond would replace the departing Ivie Anderson in Duke Ellington’s band. Ellington did hire a blues singer to replace Anderson, but it turned out to be Betty Roché and not Richmond. “Les Hite on Goodbye Tour.” Oakland Tribune 8 May 1937: 4. Lautier, Louis. “Capital Spotlight.” The Baltimore Afro-American 21 Aug. 1937: 4. “June Richmond Scoring with Dorsey Ochestra.” The Baltimore Afro-American 23 Oct. 1937: 15. “Billie Featured with Artie Shaw.” The Baltimore Afro-American 26 Mar. 1938: 11. Johnson, Lillian. “Strictly Jive.” The Baltimore Afro-American 11 Jun. 1938: 11. “June Richmond Did Not Leave Jimmie Dorsey.” The Baltimore Afro-American 18 Jun. 1938: 11. Carson, Joe. “Radio Highlights.” The Daily Courier [Connellsville, Pennsylvania] 17 Sep. 1938: 7. “Hampton to Stay in Outfit.” The Baltimore Afro-American 28 Jan. 1939: 10. Advertisement. Columbia Spectator [New York, New York] 10 Mar. 1939: 3. Advertisement. The San Antonio Light 7 Jul. 1939: 10-A. Advertisement. The Era [Bradford, Pennsylvania] 26 Jul. 1939: 3. “These Happenings Were Also Included in the News of 1939.” The Baltimore Afro-American 30 Dec. 1939: 6. “Vaudeville Reviews: State, New York.” Billboard 25 Jul. 1942: 27. Billingsworth, E. “Encores and Echoes.” The Baltimore Afro-American 28 Jul. 1942: 10. “June Richmond Comes to Maryland Tomorrow.” Billboard 2 Nov. 1942: 5. “On the Stand: Andy Kirk.” Billboard 12 Dec. 1942: 22. “Vaudeville Reviews: Fay's, Philadelphia.” Billboard 2 Oct. 1943: 23. “Kirk 221/2G in LA.” Billboard 1 Apr. 1944: 28. “Music Grapevine.” Billboard 20 May 1944: 14. “Movie Machine Reviews.” Billboard 17 Jun. 1944: 68. “Muse Tring Again, And This Time It's '4 and 20 Blackbirds. '” Billboard 24 Jun. 1944: 30. “L. Armstrong 30G, Sen. Murphy 32G, S.F.” Billboard 12 Aug. 1944: 28. “Jane Dillon Set for Top Role In Kollmar-Gardiner Musical.” Billboard 8 Sep. 1945: 36. “Windy City Gets Some New Pressing Plants.” Billboard 13 Oct. 1945: 24. “Out-of-Town Openings.” Billboard 27 Oct. 1945: 41. “Broadway Openings.” Billboard 17 Nov. 1945: 39. “Music as Written.” Billboard 29 Dec. 1945: 16. Rea, E.B. “Encores and Echoes.” The Baltimore Afro-American 18 Jan. 1947: 8. “Marriages.” Billboard 1 Mar. 1947: 46. “Vaudeville Reviews: Oriental, Chicago.” Billboard 24 May 1947: 38. “Frisco Paramount After Jack Benny.” Billboard 28 Jun. 1947: 39. “Stem Improves Slightly.” Billboard 22 Nov. 1947: 41. Waters, Ted. “From Beyond the Footlights.” The Baltimore Afro-American 24 Jan. 1948: M-1. Winchell, Walter. “On Broadway.” The Laredo Times 27 Feb. 1948: 2. “Night Club Reviews.” Billboard 28 Feb. 1948: 43. “June Richmond Goes Bankrupt.” The Baltimore Afro-American 13 Mar. 1948: 16. “Vaudeville Reviews: Casino, London.” Billboard 11 Sep. 1948: 42. “Vaudeville Reviews: Casino, London.” Billboard 18 Sep. 1948: 39. “Rhythm and Blues Notes.” Billboard 25 Aug. 1951: 83. “3 Tivoli Units Remain Open.” Billboard 29 Sep. 1951: 62. “Paris Peek.” Billboard 1 Mar. 1952: 47. “Paris Peek.” Billboard 23 Aug. 1952: 49. “Paris Peek.” Billboard 31 Jan. 1953: 46. “Sweden's Dog Days Spark U.S. Talent.” Billboard 13 May 1957: 50. “RCA, Fonior Deb Classical Promos.” Billboard 6 Nov. 1961: 48.